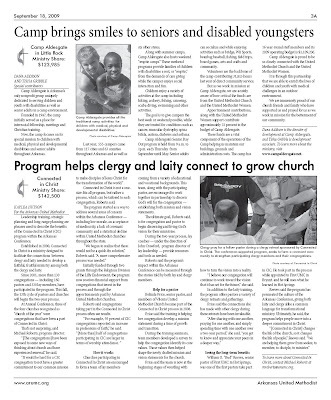 Editor:’s Note: This article was published as part of the Sept. 18, 2009, special edition of the Arkansas United Methodist, the newspaper for the Arkansas Conference of the United Methodist Church. Leadership training, strategic planning and long-range planning are phrases used to describe the benefits of the Connected In Christ (CIC) program within the Arkansas Conference. Established in 2000, Connected In Christ is a ministry designed to facilitate the connections between clergy and laity needed to develop a faithful, fruitful ministry among both the clergy and laity. Since 2001, more than 130 congregations — including 160 pastors and 320 lay members, have participated in the program. This fall, the 13th cycle of pastors and churches will begin the two-year process. At Annual Conference, three of the four churches recognized as “church of the year” were congregations that have been a part of Connected in Christ. That’s not surprising, said Michael Roberts, program director. Connected in Christ is not a one-size-fits-all program, but rather a process, which can be tailored to each congregation, Roberts said. The program started as a way to address several areas of concern within the Arkansas Conference — including low morale, an acceptance of mediocrity, a lack of covenant community and a statistical decline within United Methodist churches throughout the state. Initially funded through two grants through the Religious Division of the Lilly Endowment, the program now receives financial support from congregations that invest in the process and through the apportionments paid by Arkansas United Methodist churches. Roberts said congregations taking part in the Connected in Christ process oft en see results. Churches participating in Connected In Christ are encouraged to form a team of lay members coming from a variety of educational and vocational backgrounds. This team, along with the participating pastor, are encouraged to work together in partnership to discern God’s will for the congregation — establishing both mission and vision statements. The ultimate goal, Roberts said, is for congregation and pastor to begin discerning and living God’s vision for their ministries. During the two-year process, lay coaches — under the direction of John Crawford, program director of lay leadership — provide resources and tools as needed. Roberts said the program’s impact within the Arkansas Conference can be measured through the stories told by both lay and clergy members. Belinda Price, senior pastor, and members of Vilonia United Methodist Church became part of the Connected in Christ process in 2008. Price said the training is helping her congregation develop a mission statement during a time of growth and transition. During the training seminars, team members developed a survey to help the congregation identify its core values. Those values then helped shape the newly draft ed mission and vision statements for the church. Price said the team is now at the beginning stages of wrestling with how to turn the vision into a reality. “I believe our congregation will continue to work toward the vision that it has set for the future,” she said. In addition to the laity training, the program offers pastors a variety of clergy retreats and gatherings. Price said the connections she has made with other clergy during these retreats have been invaluable. William O. “Bud” Reeves, senior pastor of First UMC in Hot Springs, was one of the first pastors take part in CIC. He took part in the process while appointed to First UMC in Bryant, and he still uses what he learned in Hot Springs. Reeves said the program has permeated the culture of the Arkansas Conference, giving both laity and clergy alike a common language for transformational ministry. Ultimately, he said, the program helps people move into a deeper commitment in Christ. To learn more about Connected In Christ, contact Michael Roberts at mroberts@arumc.org.